Murshidabad College of Engineering and Technology was started in the year 1998 by Mr. Dipal Kumar Roy. It started fulfilling the dreams of the students of district Murshidabad of becoming technocrats of the society. It is situated in Murshidabad district of West Bengal. The rich heritage of the district has contributed to the well being of the college. Its faculty members work hard in developing good personalities capable of handling technical education with respect and professional attitude. It has the vision of making engineering minds with excellent care and support. It aims to become a college capable of offering brilliant quality education and research to the society. Murshidabad College of Engineering and Technology has the mission to mould the young minds to know the importance of technical education. The practical skills of the curriculum are incorporated with care to make the students able to compete in the engineering job market. Industry relationship is constantly maintained to make the students able to know the real world outside the college. Good manpower production is their aim with the help of good teaching members of the college. Murshidabad College of Engineering and Technology is approved by the All India Council of Technical Education (AICTE), Government of India and affiliated to West Bengal University of Technology (WBUT). ● Laboratories are well equipped to facilitate practical learning. ● Medical camps are organized and medical practitioner present in the campus to take care of sick students. ● Huge seminar hall with projector. ● Library is fully stocked with books and journals. ● Reading room is present. ● Both indoor and outdoor gaming arrangements are made in the campus. ● Canteen serves fresh food at subsidized rates from early morning to midnight. 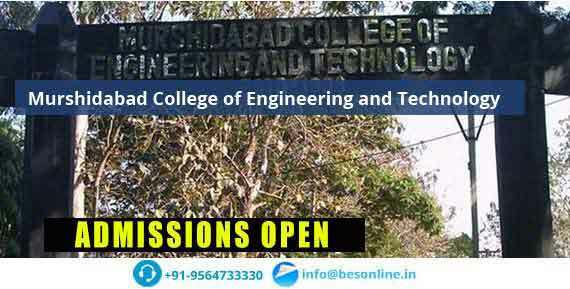 Qus: How do I get an admission in Murshidabad College of Engineering and Technology? Ans: IMS Business School Murshidabad, West Bengal, will accept the entrance exam scores of WBJEE for admission.